What SUV looks like no other, doesn't go off-road, and wants to be a sport car? 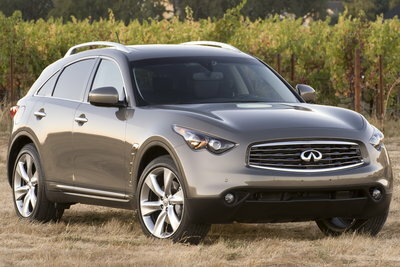 The Infiniti FX, of course! With two muscular engine choices: a 303-bhp 3.5L V-6 (FX35) or a 390-bhp 5.0L V-8 (FX50), rapid acceleration is assured. Both engines are coupled to a new 7-speed automatic and optional magnesium paddle shifters. The FX35 is offered in RWD or AWD, while the FX50 is available with AWD only. Infiniti packed the FX with a wide array of technology: Intelligent Brake Assist, Lane Departure Warning/Lane Departure Prevention, Intelligent Cruise Control, Distance Control Assist, and Around View Monitor. The optional Sport Package adds Continuous Damping Control, Rear-Active Steer and 21-inch alloy wheels. The interior features wood trim, and is far more inviting and luxurious than in the previous FX. Infiniti clearly aims the FX to take on the BMW X5, Mercedes-Benz ML-Class, and Audi Q7. The big, bold Infiniti FX gets more aggressive styling and a bigger engine. Infiniti added a new 390-bhp 5.0L V-8 for the FX50, which replaces the 4.5L V-8 previously available on the FX45. The FX35 also gets a more powerful 3.5L V-6 with 303-bhp. Both engines are coupled to a new 7-speed automatic and optional magnesium paddle shifters.